Description: A LeRoy Neiman Serigraph. This LeRoy Neiman is available as an original LeRoy Neiman, call 702-222-2221 or fill the form out on this page to inquire on buying or selling LeRoy Neiman originals and LeRoy Neiman Serigraphs from NeimansOnly.com we carry Original Neimans.A limited edition of 300 numbered impressions; 60AP, 6PP, signed by the artist Image also published as a plate-signed serigraph, image size 19 3/4" x 26"
Knoedler Publishing's March, 1996, release is LeRoy Neiman's limited edition serigraph entitled "Royal Family". A welcome new addition to Neiman's wildly successful series of African animal prints, the featured serigraph presents a family of lions reclining in the cool grass of the savannah, enjoying relief from the mid-day heat. The king of beasts and his queen attentively scan the horizon, while their cubs nestle comfortably between them. The print is dominated by the lions' golden mane and coat, which blend handsomely into the setting. 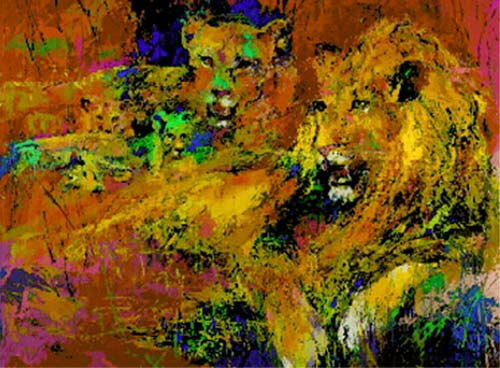 LeRoy Neiman's safaris in Africa have given us extraordinary prints of lion, zebra, elephant and cheetah which are always among his most prized images. The "Royal Family" will immediately assume place of pride among these Neiman collections.